Shop for wedding dresses at discounted prices at the Dress Dreams Bridal Boutique Sample Sale. Designers included are NOYA Bridal, Riki Dalal, Viero, and Dando London. Sizes are UK6 to UK14. All dresses are available for £1999 and below. 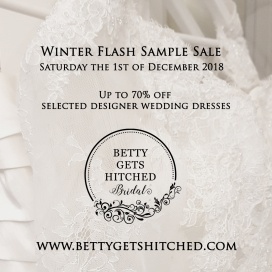 Take up to 75% discount on bridal gowns at the Teokath Sample Sale. Designers included are Alan Hannah, Lusan Mandongus, Annasul Y, Pronovias, and Eliza Jane Howell. 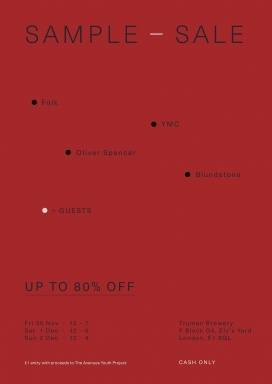 Take up to 80% off on clothing for men and women at the YMC Sample Sale. Featured brands include Folk, Oliver Spencer, and Blundstone. Cash only. Shop for women's footwear at reduced prices at Sophia Webster Sample Sale. Take up to 80% discount on women's apparel accessories, handbags, and footwear at the L.K. Bennett Warehouse Sale. Items included are dresses, coats, separates, and boots. Shop for men's apparel at reduced prices at the JORDANLUCA Sample Sale. 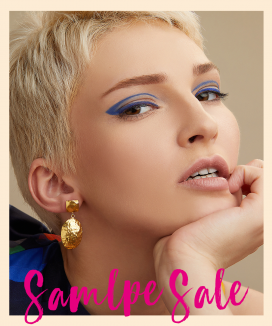 Shop for jewellery pieces at reduced prices at the MAWI Sample Sale. 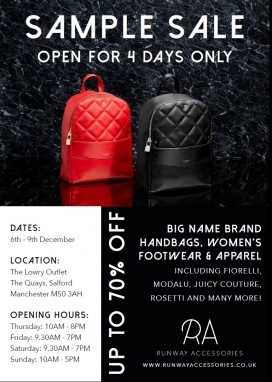 The Sample Sale will be comprised of archive, classics, and limited editions items. Take up to 70% discount on men's apparel at the Craig Green Sample Sale. The Sample Sale will be comprised of archive, show pieces, and selected stock items. 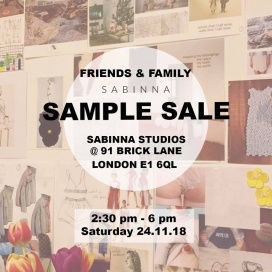 Shop for women's apparel at reduced prices at the Sabinna Sample Sale. Take up to 90% discount on men and women's apparel and accessories at the Last Chance Warehouse Sale. 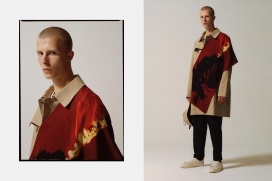 Brands included are Valentino, Burberry, Bestaff, Canada Goose, Givenchy, and McQueen. Take up to 70% discount on men and women's apparel at the Carne Bollente Sample Sale. Brands included are By Far, Blake LDNm and Mariana London. Shop artisan jewellery, including some exclusive styles, as featured on Game of Thrones and Black Mirror, and get up to 75% off. PRICES START FROM £5.00. Cash and card payments accepted.